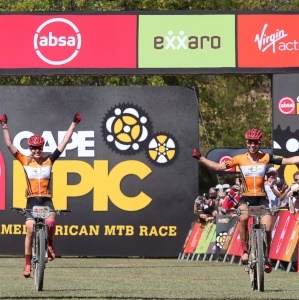 Cape Town - Annika Langvad and Anna van der Breggen (Investec-songo-Specialized) dispelled any vague suspicion that they were fading as the strongest Women’s category team at this year’s Cape Epic with a clinically dominant performance on Saturday’s penultimate Stage 6. In the race for the African Women’s Jersey, Theresa Ralph and Sarah Hill of team Galileo Risk finished the stage sixth overall – the sixth time out of seven stages they have claimed that position – and they now virtually just need to finish on Sunday to claim that title. Sunday’s Grand Finale stage takes riders from Stellenbosch University along the Trails to Val de Vie for the Champs-Élysées of the Cape Epic. The 70km route is relatively short and the podium positions look settled, but there are pitfalls which could still create a final twist.